Feel as though you are entering the magical, whimsical world of Willy Wonka by stepping foot into one of Connecticut’s best candy stores. These colorful shops sell all things delicious, from our favorite nostalgic candy, to on-trend options such as salted caramel chocolate. Who’s ready for a sugar rush? Located in the walkable downtown New London, Berry’s serves a delicious selection of ice creams and an array of everyone’s favorite candies. Their wall of candy includes a happy assortment of pick your own candies to fill up a bag. Also, the friendly owner and staff are always happy to suggest their tempting favorites. This sweet, 50s-style diner and candy store has an impressive array of candy ready to be boxed, bagged, or eaten straight away. Serving some of the best candy fruit slices around, you’ll find unique flavors such as pineapple, coconut, chili mango, pear, and more. 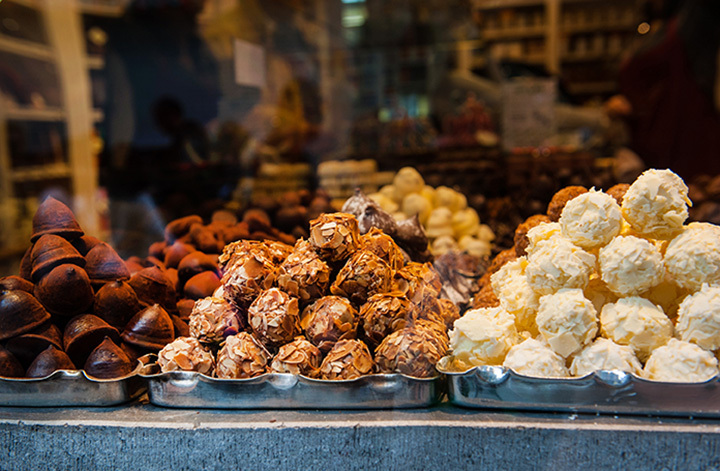 They also sell packaged candies, homemade fudge (it’s also amazing), and specialty truffles. The selection at Chocolate Works in Darien is impressive with its rows of well-stocked candy bins and cases of handmade chocolates. Aiming to teach the community how to create their own delicacies, Chocolate Works features molding, decorating, and dipping classes to both adults and kids. This candy and chocolate store is certainly on-trend with their chocolate beer bottle caps, chocolate covered pretzels, Coffee Crisp, and Fika spreads. Also available are old favorites like Cracker Jack, Swedish Fish, Oh Henry!, and Sugar Babies. Every sweet tooth will certainly find something special to take home from this local favorite shop. Stop here for your favorite candy blast from the past. With their selection of Cow Tales, candy bracelets, moon pies, and Pez, visitors are sure to find their old favorite. Numerous “newer” offerings are also available including truffles, raspberry caramels, and white chocolate caramel bonbons. Open for approximately 50 years, Fascia’s knows its candy. Other than its delicious chocolates and gelato, Fascia’s stands out from the crowd due to its awesome events. They offer create your own bar experiences, chocolate and wine parings, and chocolate tours. See’s Candies is a popular candy chain that has been open for approximately 90 years. Create a custom mix of your favorite candies, or purchase a box of their famous lollypops to share with friends or give as gifts. Brittle and toffee are also available to complete your sweets mix. Sweet Tooth’s Candy and Ice Cream Boutique sells a selection of New England’s favorite sweets such as chocolate from Fascia’s, fudge from Phenomenal Fudge, and Buck’s Premium Ice Cream. In addition, they have one thousand different varieties of penny candy like salt water taffy, Good and Plenty, and Bit O Honey. Stop by to pick up an assorted bag of your favorites. In addition to other sweet offerings, Mr. D’s provides a mind-boggling array of nostalgic candies. Look for Air Heads, Fruit Stripe Gum, licorice ropes, Mary Jane, and Boston Baked Beans. If candy isn’t your thing, hit the ice cream counter, or purchase a cake or ice cream cake for your next event. Located inside Mohegan Sun Resort and Casino, Dylan’s Candy Bar is an iconic NYC candy store. Their store inside Mohegan Sun is no less special and features a dizzying array of sweets displayed in the most fun way possible. From Pop Rocks, to Dum Dums, and Candy Buttons, they also have assortments of everybody’s favorites from the 1990s back to the 1920s.